Do you ever feel like your day is moving so fast, you might get a metaphorical speeding ticket? And that you’d enjoy being pulled over in the traffic of life because it means that you could stop moving for just a minute?! Some days definitely feel like that, but in order to maintain less madness, I try to be (ok, obsessively) organized. I have lists: to do lists, grocery lists, lists for my husband, wish lists and even a few mental notes to self. There is nothing more gratifying to me that seeing an entire list illuminated by bright pink highlighter and to feel the page wilting from the weight of my successes. Yeah, I’m like that. And while it’s somewhat entertaining, I think my lists are actually pretty useful, so I’m going to share one with you today. I downloaded this a couple years ago and then adapted it to my specific wants/needs. My apologies to whatever web site posted this originally, I honestly don’t remember where it came from. But when I need to restock the kitchen, this helps me stay focused and ultimately get only what I need, so that I save myself from the frivolous whims of grocery store end caps. Start list list from the bottom– fill in what you’d like to have for dinner most nights. It’s ok if you just write “Monday- chicken, veggie” or “Tuesday- CP lentil soup” (CP= crock pot). Give yourself a target of what you’d like to eat and then work up the list, adding the ingredients you need to purchase. It’s also helpful to keep this crock pot grocery list on your refrigerator so that when you– or someone else in your house– finishes something, they can just check it off so that you know to buy it next time you shop. This list does not need to stay pretty! Start by checking things off, then circle, add in, redefine, put questions marks… whatever helps you. Also, go through the weekly ads for the store (at home or when you get to the store) and then add in sale items that are a good buy for the week. You may even want to look at the ads before you make your meal suggestions. Depending on how your grocery store is set up, you may want to move the catagories around to make the flow easier. Feel free to make this your own. It needs to be functional to how YOU shop if it’s going to make YOUR life easier. 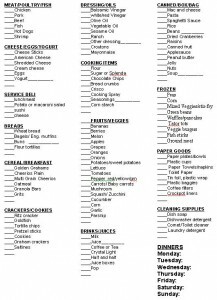 I also like that I can divide up this list and give certain sections to my husband, this cuts a lot of time off the trip and even removes some of those tempting tasty distractions that I might have been inclined to buy. I hope you find this helpful as you continue to venture into the adventure of crock pot cooking. Take it one step at a time and soon enough you’ll be eating home cooked, easy meals on more nights of the week. Enjoy!